Myth: Tang was invented for the NASA space program. In fact, Tang was actually invented by chemist and occasional playwright William A. Mitchell in 1957 while he was working for General Foods. General Foods introduced Tang to the public in powder form in 1959, but it wasn’t popular initially. This changed when NASA decided to use it in 1962 during John Glenn’s Mercury flight and later in 1965 for the Gemini program. In both instances, the Tang was used to improve the poor taste of the water from the life support system. The usage in the Gemini program particularly contributed to the previously unpopular drink mix becoming a huge hit. Because most people were introduced to Tang for the first time through the space program, this lead to the misconception that it was invented for that program, rather than just a generally available product that NASA decided to use, as it was. Mitchell didn’t just invent Tang, he also invented Cool Whip, Pop Rocks, quick-setting Jell-O, powdered egg whites, and a popular Tapioca substitute, among other things (70 patents total). In the non-food related field, Mitchell also helped invent a chemical process for developing the color green, while working for Eastman Kodak. The first major product Mitchell invented was a Tapioca substitute that was developed to get around the cassava shortage due to WWII, which is why Tapioca is sometimes called “Mitchell’s Mud”. Mitchell thought up Pop Rocks for a play he wrote about a boy who eats magical popping rocks. In the play, every time the boy eats one of the rocks, he’s teleported to another world. Later, when Mitchell was working for General Foods, he was attempting to come up with a way to make “instant” carbonated drink and accidentally invented Pop Rocks in the process, which he named Pop Rocks, referencing his play. For how Pop Rocks Pop, check out this link. Project Mercury was the U.S.’s program to put a man in space for the first time. Objectives of the program were to orbit a person around the Earth; investigate a human’s ability to function in space; and to bring that person home safely. The program ran from 1958 to 1963 with all total NASA launching six manned flights. Tang was included in the menu for John Glenn’s 1962 Mercury mission where he orbited the Earth and experimented with eating in space. The Gemini program’s primary objectives were to test man’s ability to cope with long term flights in space; to maneuver a spacecraft in space, including docking with another spacecraft; train and prepare the flight and ground crews for the upcoming Apollo program; experiment with space walks; test out equipment and technologies that would be needed in the Apollo missions; and controlled re-entry. The program included 19 total launches, only 10 of which were manned. It isn’t known exactly if Tang was used in the Apollo 11 mission. The astronauts there decided to use a grapefruit-orange mix, which may have been a variant of Tang or may have been something else. 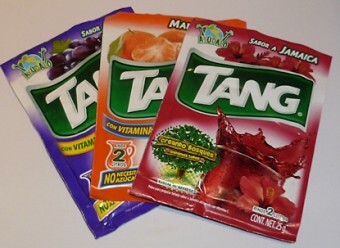 Both Buzz Aldrin and Neil Armstrong both have stated that they didn’t use Tang, but because Tang came in a variety of flavors and, during the missions, was labeled things like “Orange Aid” and the like, rather than Tang, so it may well have been Tang they were drinking. Methadone was once sold packaged with Tang, in an attempt by Philadelphia officials to stop people from injecting the drug into their bloodstream. Unfortunately, they underestimated the addicts, who seemed to have no qualms with injecting the Tang/methadone mix, which obviously isn’t advisable. Tang, hydrogen peroxide, and hexamine were primary components of the explosive meant for the failed 2006 transatlantic aircraft plot. These, and other components, were used to make HMTD (Hexamethylene triperoxide diamine), which is a fairly powerful homemade explosive. HMTD was also going to be used in the failed 1999/2000 bombing of L.A. International Airport. This took place on the second to the last lunar landing mission, Apollo 16. Commander John Young really liked Tang, so much so that he added it to the water bag in his space suit so he could drink it during his 22+ hours of moon walking. Trouble is that the Tang being a little grainy and sticky when dried kept the valve on the drinking tube stuck open. That let Tang leak into his suit and down his body, turning into a sticky mess. So much for the glamor of space travel. Well that was clever leaving the recpie for a home made explosive on a public forum like this and yes i know this knowledge is easly asseable on the internet but why make it easy to fknd. OK, so now you know what 3 things it takes. How much of each do you need? What order do you combine them? What temperature? Do you use glass or metal containers when combining? Do you stir the mix, shake, or leave it alone? Is the product stable, or does it require special conditions to store, transport, and use? News flash for you; nitroglycerin is made from nitric acid and glycerol. Now that you know the recipe I’m sure you can figure out the rest, right? Does anyone know the name of the play he wrote about the boy who ate pop rocks and was teleported to another world?